What Should I Eat if I’m Pregnant? While expectant mothers are not exactly eating for two (more like one and one eighth), you do need more nutrients and vitamins during your pregnancy. Even well before you need to buy maternity wear there will be foods you should include in your diet and foods that you should avoid. Here we look at the foods you should eat and those to exclude from your pregnancy diet. Emphasize fresh, unprocessed, natural and organic foods in your pregnancy diet. Make sure you eat an appropriate number of servings from each food group. Take a multivitamin supplement or as prescribed by your doctor. · Vitamin A -- helps with embryonic growth for your baby while fighting any infections. It is essential for post-birth tissue repair. Find it in red, green, orange, yellow and dark green vegetables. · Vitamin C – helps with tissue repair, bone growth, healthy skin, absorption of iron and boosts your immune system. Find it in citrus fruits, kiwis, red berries, broccoli, parsley, strawberries, kale and brussel sprouts. · Vitamin E – helps with neutralising free radicals and regulating cell membranes. Find it in wheat germ oil, almonds, sunflower seeds, and hazelnuts. · Vitamin K – needed for blood clotting. Find it in green leafy vegetables and dairy products. · Vitamin B6 – helps with metabolising proteins, fats and carbohydrates and is essential for producing blood cells, antibodies and supporting your baby’s brain development. B6 is also known for alleviating morning sickness. Find it in beef, liver, pork, wholegrains and bananas. · Vitamin B12 – helps with cell growth. Find it in liver, fish, poultry and meat. Vegetarians might need to take a supplement. · Good Fats – Pregnant women need more omega 3, 6, and 9 oils in their diet to promote healthy skin, heart and hair. The omega oils also help with mood and hormonal balance. Take a supplement or find them in flaxseeds, evening primrose oil, oily fish and fish oil, green leafy vegetables, legumes, and citrus fruits. · Folic Acid (Vitamin B9) – an essential pregnancy vitamin that helps with preventing birth defects. Find it in leafy green vegetables, enriched grains, kale, spinach and orange juice. · Iron – essential for the production of red blood cells to deliver oxygen around your body and for avoiding anaemia during and after pregnancy. Find it in lean red meats, cereals, whole grains, nuts, seeds, dried fruit and spinach. · Calcium – helps with blood clotting and helps your baby grow healthy bones, teeth, heart, and muscles. Find it in almonds, sesame seeds, collard greens, blackstrap molasses, tahini, chard, dried figs, broccoli, sardines and canned salmon with bone. · Alcohol. Avoid all alcohol during your pregnancy and even when you’re trying to conceive as it can harm your baby’s cells, brain and nervous system. Learning difficulties, behavioural and developmental problems, as well as stunted physical growth and permanent facial deformities can result in babies whose mothers drink heavily during their pregnancy. · Raw Foods. Avoid sushi, raw shellfish, and any raw or undercooked foods, especially seafood as it can contain worms and other parasites. These can rob your body of nutrients as well as bacteria which can make you sick and create complications. · High Mercury Fish. Mercury in your diet can lead to birth defects. Avoid fish higher up in the food chain such as shark, swordfish, tilefish and king mackerel. Limit fish intake in general and eat small fish, such as sardines. · Smoked Seafood and Soft Cheeses. Avoid smoked seafood and soft cheeses as they may contain the harmful bacteria Listeria which can cause miscarriage or blood poisoning. · Processed Meats. Minimise the consumption of preserved and processed meats as they may contain nitrates and also Listeria. In between decorating the nursery, picking out maternity dresses, and planning for your new addition, make sure you do eat well and get all the nutrients that you need. Remember that you should always work closely with your doctor about your diet if you have any doubts at all. The latest issue of My Child magazine is out so naturally we were eager to read it. 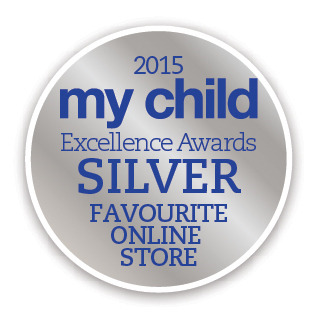 What a fabulous way to discover that we have won Silver for Favourite Online Store.